Home » 10 Best Horse Trailer Brands You Should Know! 10 Best Horse Trailer Brands You Should Know! There is no doubt that a horse trailer is necessary if you are a horse owner. Nowadays, there is a wide variety of horse trailer with different styles, different models, different quality and different brands. It is impossible to find out a perfect horse trailer which is suitable for all horses. You can only buy the right horse trailer which is fit your horse. And if you are wondering what the best horse trailer brands are, let me show you some suggestions in this article. How To Choose The Right Horse Trailer? #1: Do you really need insurance for your horse trailer? #2: How much weight can a two horse trailer carry? #3: What is the safest way to load a horse trailer? Sundowner is considered one of the pioneering manufacturers in horse trailers. Many horse owners opt for Sundowner trailers because of their high quality. Sundowner provides different types and styles of horse trailers. You will have pleasant experiences with your horses in Sundowner trailers. After buying a horse trailer of this brand, you do not need to fix anything. Each trailer is designed to meet the requirement of customers. If you are finding stock trailers in both gooseneck and bumper pull, congratulations! Maverick trailers are what you need. Durability and safety are universal reviews about Maverick trailers. The price is reasonable and Maverick trailers are worthy of your money. You will own a solid and sturdy Maverick trailer for many years! I have to mention Featherlite Trailer in the list of the best horse trailer brands. Both interior and exterior features of Featherlite trailers will make you feel amazing. Almost all their trailers are made with aluminum (including skin and frame). This material is the favorite of many customers because of its advantages. You can use an aluminum horse trailer for a long time. Besides, payload capacity is also higher, according to Featherlite users. If you are planning to buy a horse trailer, Featherlite is worthy of considering carefully. Exiss, like Featherlite, is a part of Universal Trailer Corporation. Exiss Trailer was officially built in 1994. They supply high-quality aluminum horse trailers at affordable prices. The manufacturers of Exiss has more than 30 years of experience, which make sure that you will be satisfied with their products. No matter how the horse trailer you need is, you can find an Exiss suitable one. The slogan of Exiss Trailer is “Transport your animals in comfort and safety”, and surely, it is also the wish of horse owners. If you are ready to purchase a safe and luxurious horse trailer, visit the website of Trails West Trailer. They provide a wide variety of different trailers from bumper pull to snowmobile trailers, from gooseneck to living quarter trailers. Trails West knows all about your wish and your requirement. Every their trailers will suit your needs. With over 30 years of experience, the goal of Trails West is providing the safe and top-quality horse trailers to their customers. When you search the best horse trailer brands on the internet, it is certain that 4-Star Trailer is a favorite brand of many horse owners. The key to success of 4-Star is they always change, improve and refine to have better trailers. They make sure that each trailer will be upgraded to higher quality in design, features, and options. A specified person, as well as his or her horses, have different requirements, different interests, or different habits. 4-Star Trailer is aware of this, so they always make a great effort to help customers find the right horse trailer. This is the promise of Merhow, and obviously, they have built trust and love in customers. Established in 1955, Merhow is a familiar horse trailer brands to equine enthusiasts in North America. Merhow focuses on producing the safest and highest value horse trailers. Being in the top list of the best horse trailer brands, Merhow trailers are worth looking for. If you are finding a good bumper tower or 5th wheel horse trailer, we highly recommend Hawk to you. Hawk is a reputable horse trailer brand I want to introduce. Hawk always focuses on building long-lasting relationships with customers. Their priority is manufacturing the perfect horse trailers which horse owners can afford. You should visit the website of Hawk to know more about their products. And you will see why Hawk is the choice of many horses as well as equine enthusiasts. You will be impressive on the slogan of this horse trailer brand. To Cimarron Trailer, their success comes from the satisfaction of customers as well as the beloved horses. They are always ready to reflect themselves and receive feedback of dealers to improve their horse trailers. Cimarron Trailer ensures that your needs are their first concerns. The last horse trailer brand I want to mention is Logan Coach. Logan has a big collection of different types and styles of horse trailers. Their products come with several standard features. 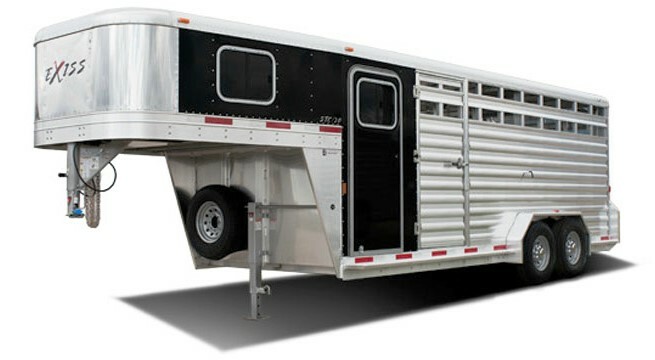 The horse trailers of Logan have a strong frame, rubber floor, adjustable saddle racks, and several benefits. High quality is the reason why Logan Coach is in the list of the best horse trailer brands. Logan trailers have great value for their price. As I mentioned, there are many different types of horse trailers. They are classified depending on their size, their usage or their structure. In this article, I will introduce some popular types of horse trailers which most horse owners should know. If you want to carry fewer than 3 horses, bumper tower or tag-along trailers should be taken into consideration. Bumper tower trailers are often smaller than other trailers, especially goosenecks. More importantly, you can connect it with your vehicle without any special requirements. All you need to do is hitching the coupler in front of your horse trailer to the bumper of your vehicle. A reasonable price is also a strong point of this type of horse trailer. When towing more than 3 horses, equine enthusiasts will choose gooseneck trailers. They are designed to long-lasting trips with a trailer body and an overhang. Compared with bumper tower horse trailers, goosenecks are safer and more stable to drive. However, you have to use tack so that the coupler of the horse trailer is connected to the truck. There is an area for tacks and saddle racks (in some cases) in front of goosenecks. How is a horse trailer you need when you are planning a long-distance journey? Or you and your horses must stay many times for business or shows? In this situation, a living quarter horse trailer is the best idea. It is a perfect combination of a horse trailer and a fifth wheel travel trailer. Like other types, at the rear of living quarter horse trailers, there is a room for your horses and gear. Also, you can stay in your vehicle where bedroom, bathroom, and kitchen are equipped fully. Because of its advantage, you need to pay a high price to own a living quarter horse trailer. How horses stand in their trailer is the most remarkable difference between slant load trailers and straight load trailers. However, horse owners often choose slant load trailers if they have more than 3 horses. Meanwhile, straight load trailers are similar to bumper tower trailers which are suitable for transporting from one to two horses. If you are aware of some common types of horse trailers, let me show you several helpful suggestions to have an ideal trailer. Before listing the best horse trailer brands, we need to know the essential features of a standard trailer. The first thing you have to consider is whether your trailer size is fit for your horses. It relies on how big your horses are. Make sure that the horses feel comfortable when they stand in the trailer during the trip. The rooms need to have enough space for horses’ head and neck to move. Also, they require a suitable trailer which horse can spread and stretch out their legs. Besides, if you have different types of horses, remember to opt for a horse trailer which fits your biggest one. Ventilation is also an important feature of a horse trailer. 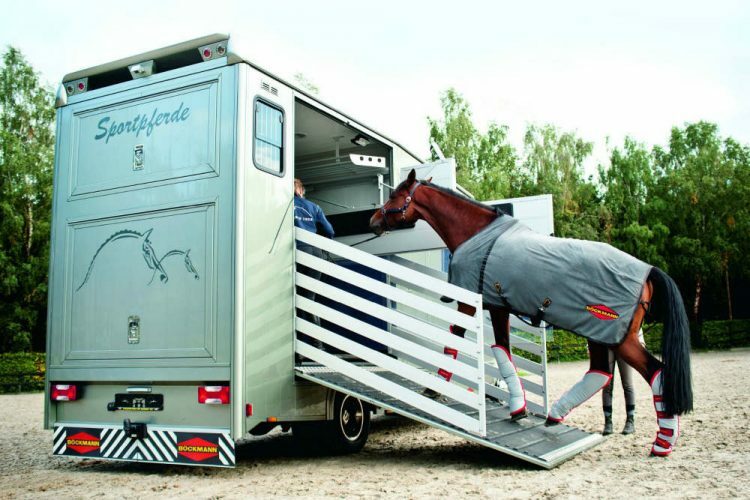 A trailer which is well ventilated will keep your horses feel comfortable. This control the temperature inside the trailer. Carbon monoxide, as well as gases from urine and manure, is harmful to your animals. Additionally, when your trailer doesn’t move rapidly enough, the inside temperature can get higher 20 degrees Fahrenheit than outside. These are the reason why proper ventilation is very necessary to horse trailers. There is no doubt that horse owners always care for safety problems, especially during traveling. You need to check the horse trailer carefully before buying it. Avoid any sharp corners or edges, even something which protrudes outward. Almost all these objects can injure your horses. Do not forget to confirm that the exit door of your trailer is active. A good ramp which is low, non-slip and stable will helps your horses slip more easily. Make sure that the floor, as well as underbraces, is always in proper condition. When choosing a horse trailer, you should check to verify that the brakes and lights are working. The last things I mention are styles and types. There are three main styles of horse trailers. The first trailer has a fixed manger in front of it. You will have extra space underneath the manger. The second one is the walkthrough trailers. The unique feature of this type is that horses can walk into the trailer and handlers can walk out a standard full-size door. Another type is the slant-load trailers. As I mentioned above, these trailers are fit for transporting many horses. The different types of horse trailers are introduced in the previous part. Based on the unique features of your horses, you will choose the right trailer for them. There are many different aspects of a trailer you need to take into account. So, to help you solve this difficulty, let me show you my favorite horse trailer brands. Maybe you will find out the best brands and their suitable products for your horses! Horse trailer insurance will protect you, your vehicle, and your four-legged friends. Insurance can help you not only cover legal responsibility for damage but also protect your trailer against theft. With several benefits of insurance, I think it is necessary for you and your horse trailer. Each particular horse trailer has a precise amount. You can find out the information about weight a specific two horse trailer can carry on the internet. Normally, a bumper pulls 2 horse trailer without a dress can carry about 2400 lbs. Meanwhile, a gooseneck one can carry 4600 lbs. Loading a horse trailer is a difficult experience. Both horses and owners might get injuries during this process. You need to be patient. Using the right method will help your horses become safer and more comfortable. My suggestion is rewarding each step. You can build trust and familiarity through this activity. Patience is key. Be nice and listen to your beloved horses. In this article, I mentioned the basic knowledge about horse trailers, several helpful tips for buying a suitable vehicle, the best horse trailer brands and some questions you might have. We hope that this post will help you and your beloved four-legged friends. Owning the right horse trailer which brings safety, comfort, and happiness to your horses will be a great thing!